Taking the Hull Ferry crossing to Rotterdam will shorten your trip by many miles which you'd otherwise have to drive.The Hull Ferry to Rotterdam crossings sail overnight which make those miles disappear while you are sleeping.Wake up the next morning arriving at Rotterdam refreshed and raring to go. Northern Europe consists of a superb road netword making the Hull to Rotterdam Ferry crossing perfect for exploring the many fantastic cities and regions of the Netherlands such as Arnhem, the South Limburg region, De Efteling theme park and of course Amsterdam.Where ever you visit you will surely leave with many memories of a great trip.All of it is so easy to access with a luxury cruise ferry from Hull direct to Rotterdam. Why not travel in luxury on P & O Ferries to Rotterdam from Hull.P&O Ferries do daily crossings sailing overnight from Hull to Rotterdam.By boarding the ferry in the evening there's plenty of time to relax, chill out and take advantage of the fantastic facilities onboard the ferry before sailing off into the night for a morning arrival in Rotterdam. Perfect for short trips to Amsterdam, or longer journeys into the continent, the Hull Ferry crossing to Rotterdam begins your journey off in comfort and you get to your destination feeling relaxed and ready to go.Ticket prices alter depending on when you want so depart so make sure to check the fare when booking.Arriving at Rotterdam you are free to go forward on your journey to Amsterdam or the rest of Europe. 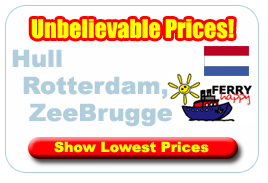 Also available to book here online are cheap ferries to Amsterdam, Bilbao & Jersey. Rotterdam is The Netherlands most modern city which began as a fishing village way back in the 13th century.Rotterdam was developing into an industrial and trading power when during World War II German bombers destroyed the city centre and port in 1940. Even so, Rotterdam's unique architecture brings many tourists to cycle around this fantastic cosmopolitan city.In historic Delfshaven old style Dutch houses can still be found.This is where the pilgrims set sail in 1620.There are many cultural offerings ranging from the summer carnival to classical music which can compete with those of Amsterdam.